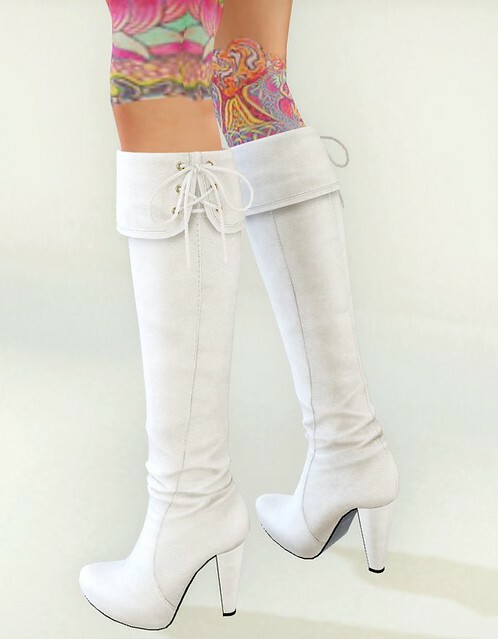 I promise to take these new G-Field Long Cuff Boots off tomorrow, but today… they go perfectly with the new Jersey Dress from Mon Tissu, so I’m wearing them again!! Even though I wear light Blonde hair often, I’ve been thinking of switching to a lighter Brown hair color, but there are just so many nice Browns to choose from!! I’ll keep searching for my favorite shade from all the hair designers, but so far the list is long! Do you change your hair color pretty often or just stick to one color? I pretty much stick to one color. I had dark brown for a couple years and then switched to red last year. Sometimes it’s hard to find good reds to wear, but I’m sticking with it anyway. On the rare occasion I go blonde just for kicks. Is that really a texture top with mesh bottom? Like PixelDolls used to do? Yep! This is a texture top with mesh skirt attachment. I mostly wear the same color, although it’s hard to match the brown from one designer to the brown of the other. So I do wear different shades of brown, just because it’s impossible to always wear the same. I usually stick to the darker browns, but I love Magika’s new Trio color set. It’s fun to have a little change every once in a while. My one avatar (Carina Gonzales) IS me. That’s even my real name and so since I have black hair so does she. My role playing avi, Adiana Maru, mostly wears Catwa’s Espresso. I love the subtle highlights in that shade! i am brown 99% of the time, but i have bought a few packs of lamb brown hair colors. i find so many browns have a burgundy or greenish undertone and lamb’s are just like a really nice golden (i like twix the best). not sure if you wear them but they are sooo nice. My skin and hair and haircolour changes with every outfit. I am Brunette all the time, on rare occasions I’ll go blonde for like 5 mins. I like Blonde Gogo Best , but it’s fun when brunette Gogo comes out to play. You’re always trying to go brunette but you’re a blondie at heart. Where o where can I find actchio tattoos? I’m just in love with the design and those colors! I’ve searched inworld and on marketplace and to no avail… Is there anyway you could let us know the creator’s name at least? And also, I’m totally blonde at heart… I’ve gone through brunette phases on occasion to change it up, but I can never stick with it — I always end up blonde again. So more power to you Gogo, if you can make the brunette commitment. Occasionally I’ll wear a blonde for my hubby for roleplay, but that doesn’t really count.